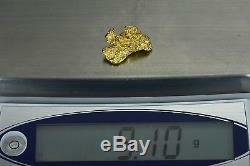 Australian Natural Gold Nugget Weighs 9.10 Grams. Most of my Australian nuggets come from Victoria's Gold Triangle area. Australian nugget are very high in purity running from 94-98% pure. All Nuggets are Pictured or Partially Pictured with a U. S Quarter which is 24.5MM in diameter to give you an idea of Size Proportion. Natural Gold Nugget Pioneering from the Australian plains, fields, & the tip of a metal detector uncleaned direct to your living room..... Through using my resources at the world number one Natural gold Jewelry Manufacturing shop once know as Conner's. And now the company Orocal. If it isn't authentic. The Details Behind Your Gold Nugget. What is a Natural Gold Nugget? It is a piece of gold that broke out of quartz deposits within the earth when erosion took place. It also goes by the name Placer Gold and each piece is a one of a kind with no two being exactly alike. They can be cleaned in different solutions, and then tumbled in different media to give it the shine. What do we mean by Authentic, Genuine, Natural Gold Nuggets? Not all Gold nuggets are natural, some people man-make them by taking smaller gold flakes melting them and casting them into the shape of a nugget. 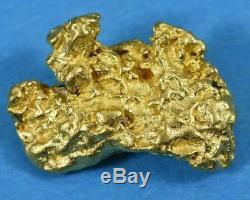 The item "#1195 Large Natural Gold Nugget Australian 9.10 Grams Genuine" is in sale since Wednesday, March 28, 2018. This item is in the category "Coins & Paper Money\Bullion\Gold\Nuggets". The seller is "nuggetsbygrant" and is located in Oroville, California. This item can be shipped worldwide.